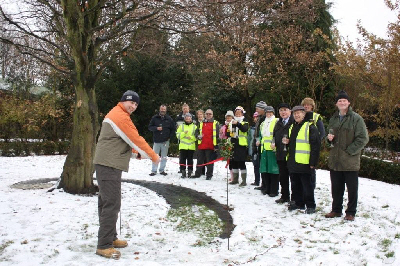 The Friends of Walkden Gardens are grateful for the help and financial support given by Greening Greater Manchester for this project. 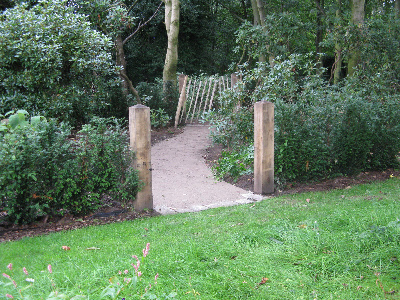 This is the largest scheme undertaken by the Friends of Walkden Gardens. 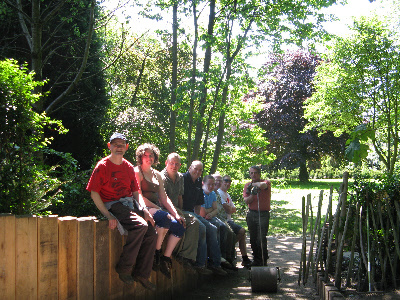 Since the launch day in November 2008 enthusiastic and hardworking community volunteers have given over 600 hours of their time to build this project. 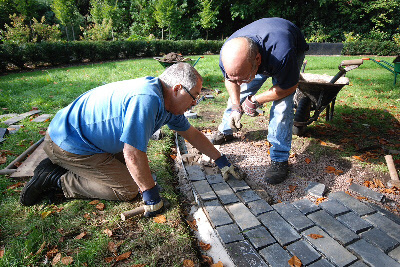 We cannot emphasise enough our thanks and appreciation for all their hard work which has culminated in the creation a fine garden with strong design elements and high quality materials. 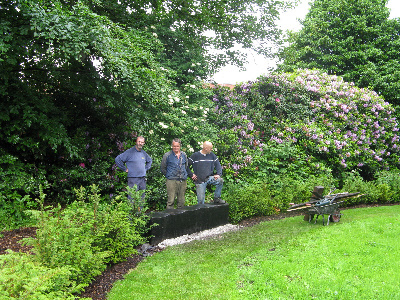 The Friends of Walkden Gardens have enjoyed working on the Garden……..we hope you enjoy visiting! 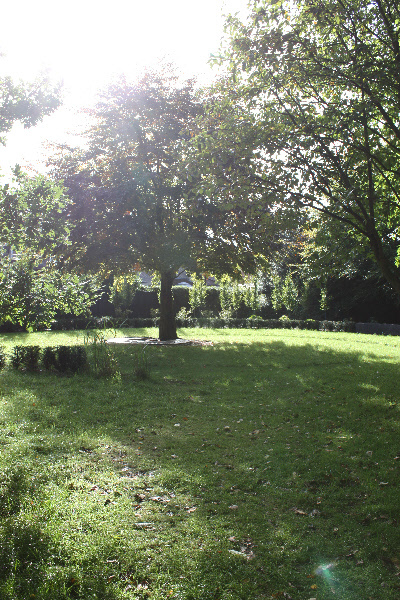 Miss Cordingley’s Garden has a fascinating history, being part of a plot of land bequeathed to Sale Borough Council by the local benefactor Harry Walkden. 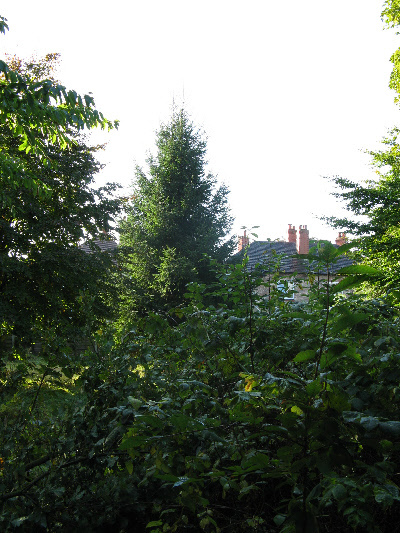 The bequest allowed use of the land by Harry Walkden’s niece, Miss Nancy Cordingley, a resident of Marsland Road, and it has only recently been made part of the wider Walkden Gardens site now owned by Trafford Council. 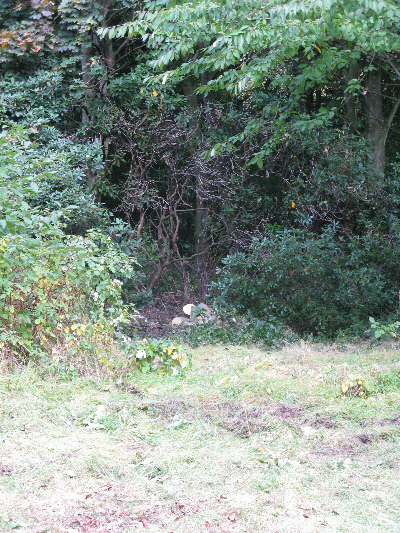 The land had never been used by the public and had become overgrown and inaccessible. 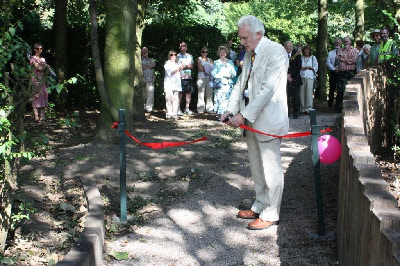 The aim of this project was to finally make this tranquil area fully accessible to the community as originally planned by Harry Walkden and we have named it Miss Cordingley’s Garden in her honour. Miss Cordingley’s Garden was funded by a special birthday present – a £15,000 donation to transform what was a derelict space into an exciting area that welcomes visitors. The cash came as part of the 10th Birthday celebrations of Greening Greater Manchester (GGM), a scheme funded by Biffaward, a multi-million pound environment fund which uses landfill tax credits to support worthwhile environmental projects across the UK. 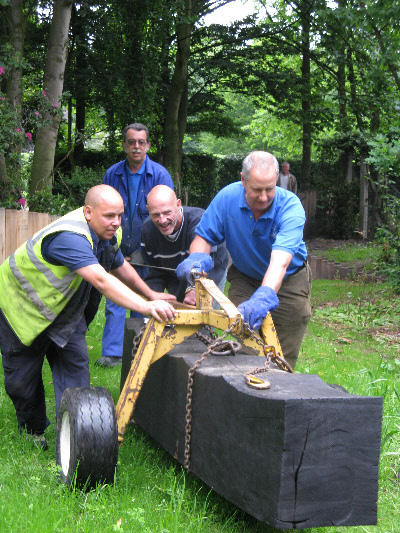 Managed by the environmental regeneration charity Groundwork, GGM has awarded almost £4.75 million to help hundreds of dreams to become a reality over the past decade. 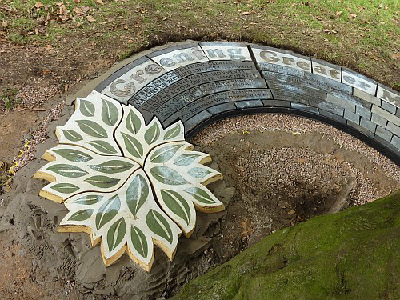 “The Greening Greater Manchester award has meant that we can begin the year long process of reclaiming and transforming an inaccessible area into a real jewel” said project co-ordinator Penny Maitra in 2008. 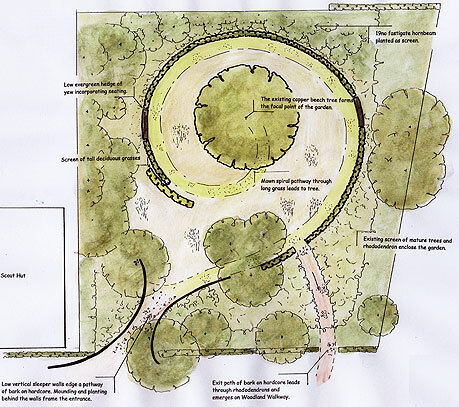 Whilst providing access to this long unused space, the design aimed to keep its tranquil feel by providing mown paths through long grass around a fine young beech and by retaining the surrounding mature rhododendron boundaries. A strong and inviting entrance and clear exit were included to ensure the new space became a well used part of the Gardens. 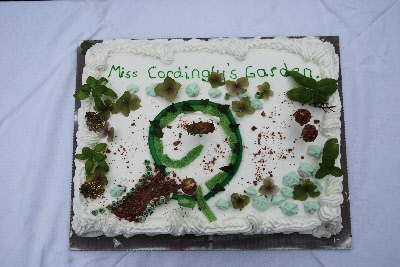 The original design for Miss Cordingley’s Garden is shown below. 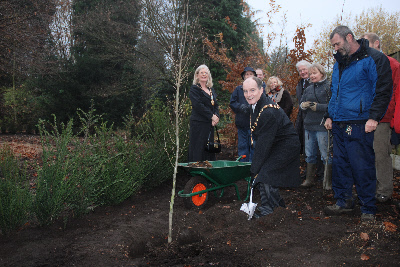 On Saturday 29th November 08, a very cold and foggy day, the Friends of Walkden Gardens were joined by the Mayor of Trafford Councillor Stephen Adshead and Mayoress Councillor Judith Lloyd for the launch of this project. Well wrapped up volunteers came to view the design and the display model of the proposed Garden. 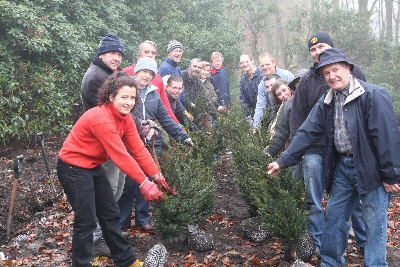 They then got their hands dirty by helping to plant shrubs and trees. May we say a big thank you for the wonderful celebration cake, decorated by Mrs Gillian Jones. 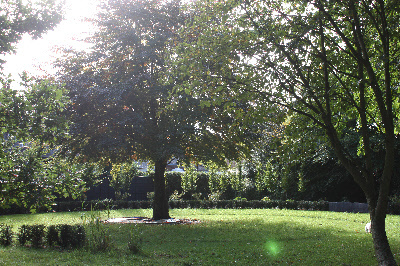 The area where Miss Cordingley’s Garden now sits was very overgrown. 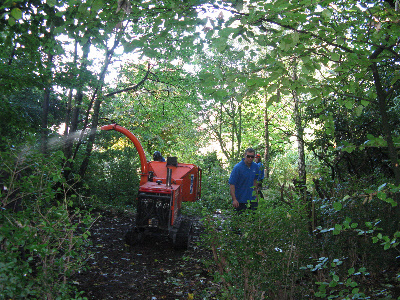 Volunteers first removed a section of hawthorn hedge and then cut their way through 10’ high cotoneaster and stands of wild raspberry. 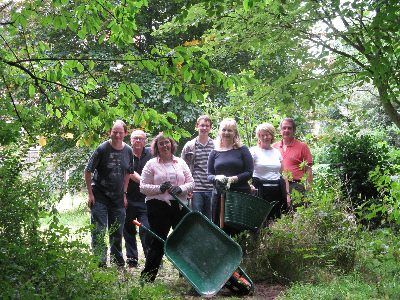 It was more like hacking through a jungle than gardening! 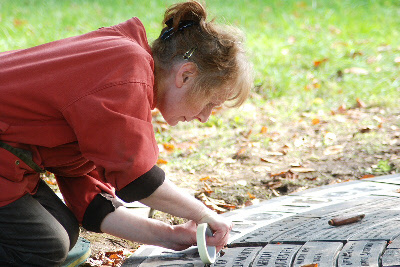 Volunteers efforts begin to pay off. You can now see an entrance into the garden. 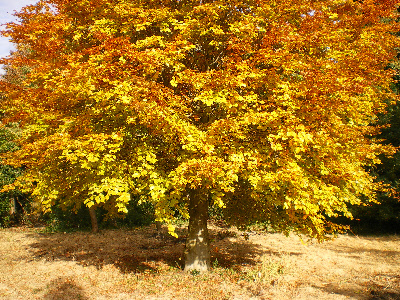 Once we could enter the garden and see what needed to be removed, a gang of tree surgeons were employed. 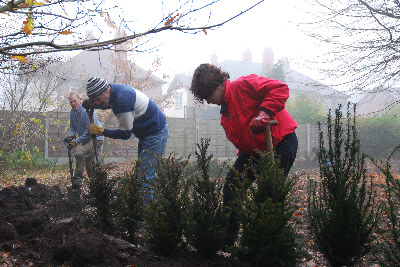 They worked hard to remove unwanted trees and seedlings and ground out unwanted stumps. At the end of one day we could finally see a garden rather than a wilderness. Then came the sleeper walls! 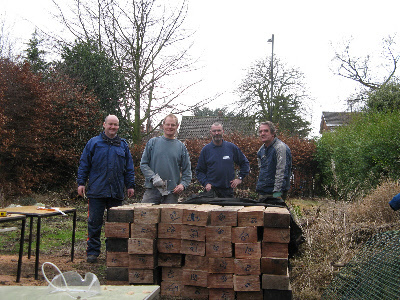 Our Head Gardener, Mike Girling, assisted by his supervisor Martin Telfer and FOWG volunteers, cut oak sleepers to length and routed corners to create the building blocks we needed to create the stepped and curved walls detailed in the garden design. 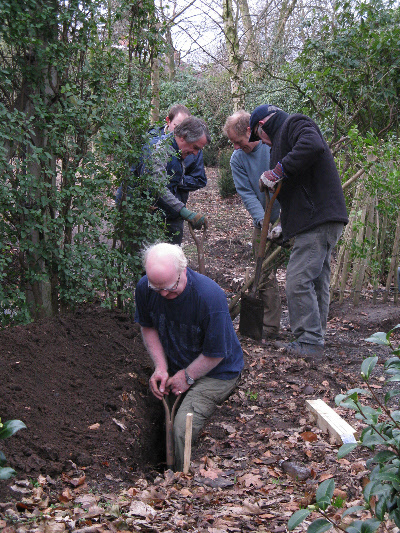 Then, over a series of tough workdays, volunteers dug trenches and carefully concreted the sleepers into position. Those of you who joined the workdays will remember the digging prowess of former volunteer Hugh, now a resident of N Wales, pictured below waist deep in the trench and heading for Australia! The entrance was completed by paths of bound gravel and plantings of Vinca and Rhododendron either side of the walls. Once the central area of Miss Cordingley’s Garden had been cleared of ‘The Jungle’ it was levelled and long grasses with distinctive seed heads planted to create an informal lawn, reduce the time and energy required for cutting and provide valuable seeds to attract wildlife. A spiral lawn path has been cut through the long grass and leads to a young beech at the focal point of the garden. At the launch day a 45m long distinctive spiral yew hedge was planted and 16 no fastigate hornbeam to screen adjacent housing. Later 40no specimen hydrangea were added behind the hedging to give late summer colour. 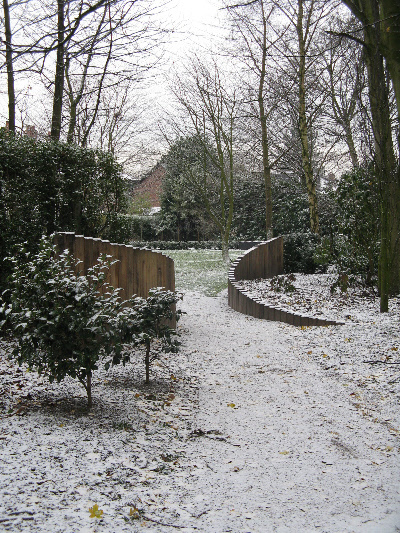 We commissioned Chris Nangle Furniture to create 2no charred oak benches specially shaped to suit the curve of the yew hedges and carefully wheeled these into position in June 2009. Visitors to a public garden always feel safer if there isa separate entrance and exit to each space they use. 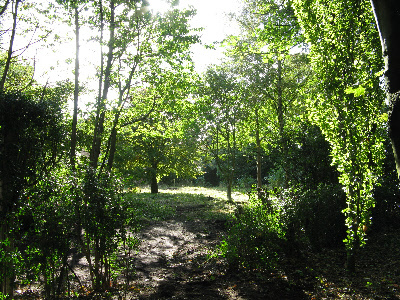 The exit to this garden is a low key bound gravel path leading out into the woodland areas beyond. 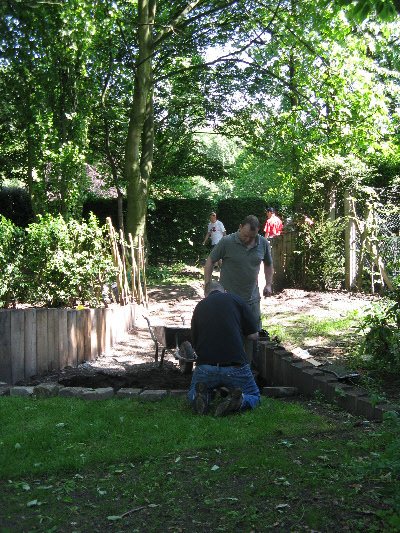 A garden is never really finished but towards by September 2009 the space was complete enough to be used. At the heritage open day on Saturday Sam Youd, head gardener at Tatton Park agreed to join us and formally cut the ribbon opening the garden to the public. The Mayor of Trafford, Cllr David Higgins, joined us to help celebrate the day. 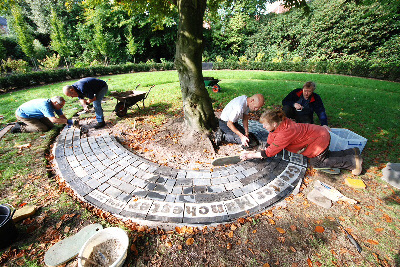 We were putting the finishing touches to this garden when we were approached by Greening Greater Manchester to create a feature to mark the culmination of a £4.75million environmental programme to help make Greater Manchester a greener place to live, work and play. 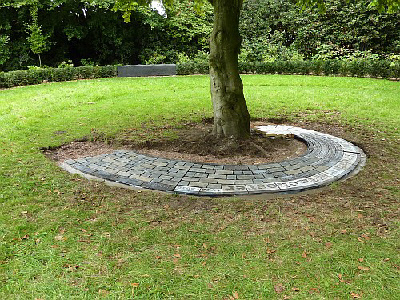 We commissioned local ceramicist Gordon Cooke to design this feature, resulting in the creation of ‘The Spiral’ a high quality ceramic and black limestone walkway which celebrates Greening Greater Manchester, the success of all GGM projects and this garden in particular. ‘The Spiral’ was installed by volunteers and is a fitting centrepiece to this new space. It was opened in Dec 2010 by Steve Tanner.